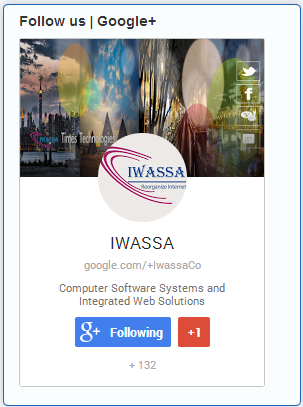 IWASSA Co.: Get all New relative to Technology and Information Security | Follow us | Google+ !!! Get all New relative to Technology and Information Security | Follow us | Google+ !!! Get all New relative to Technology and Information Security. Get all New IT discussions and tutorials on IWASSA+, create your Owen discussion or leave interactive comments with you friends on Google+. I Want A Safe System Alone (IWASSA) is a fast growing Computer software system development company specializing in the creation and implementation of innovative web solutions and support around the globe since 2010. The Headquarters together with branches and support offices as well as freelancers worldwide, has a professional team of 32 highly skilled, trained and dedicated experts in their fields gathered to ensure their clients the best possible innovations, solutions and support that matches their needs.